A video art project created with zero production value. 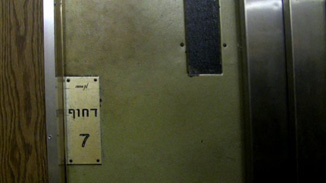 The piece deals with the concepts attached to the Sabbath elevators, these elevators, often seen at hospitals, stop on every floor, their doors open allowing religious passengers the option to go to their desired destination without violating the Sabbath & omitting the interaction & activation that is usually associated with elevators. In this case, the elevator door does not open, this is more like a child’s-play, we go up and down seven floors, we end up in the same place we started, the only thing that changes is the commanding typography [PUSH] on each floor. shot on location at 1 Gaza street, Jaffa. April 2012.
contains no actors, no camera movements, no edits, no music and no post production.